The list below is arranged in alphabetical order of the village or town of the tower to which the ringer belonged. 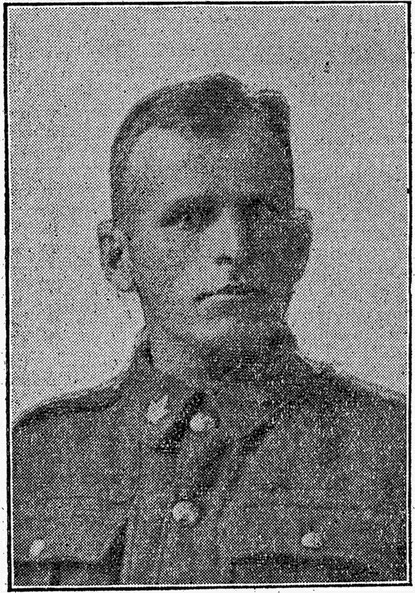 Horace Whitehead (RGA) – served in England and France. Kevin Moon from Charing has come up with another ringer who should be on the Roll of Honour [writes Hazel Basford, who goes on to say] I visited Charing recently to go through their Parish Magazines for WW1 for references to the VAD Hospitals there. Kevin is another WW1 addict and he was browsing through them. 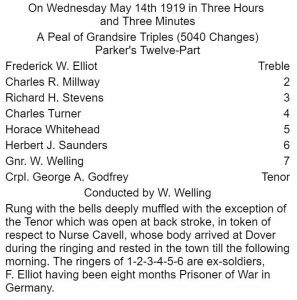 He did not mention it at the time, so perhaps he saw it later but I had a letter from him this morning saying he had found a reference to a memorial service held in 1916 and “a muffled peal of bells rung by his old comrades in the Belfry”. The service was for a Charles Colbreay who had died in Gallipoli in 1915. I checked the Annual Reports and found the 1912 Report includes one C Colbreay at Charing. It really is amazing that the record is still being brought up-to-date after all these years. Don’t assume that, just because the Roll was first compiled over 80 years ago, it is necessarily complete. If there is any possibility that there is a name from your tower which possibly ought to be on the list, do please contact Hazel, and she will make every effort to sort out the facts. I posted a note about the Roll of Honour on the Kent Family History mailing list when someone suggested posting information about war memorials at this Remembrance time. As a result the granddaughter of George Mills of Borden has got in touch with me. She knew nothing about his ringing although she attended Borden church as a youngster. I can’t tell how pleased I was to find the web site for KCACR. 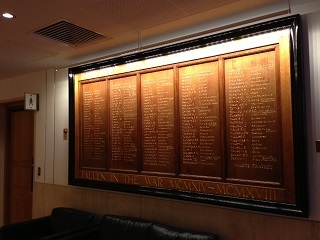 I was searching through web sites for the Royal West Kent Regiment and other Kent sites, when I came upon the Roll of Honour. I was delighted and proud when I found that my grandfather Tom Cox was on that roll. 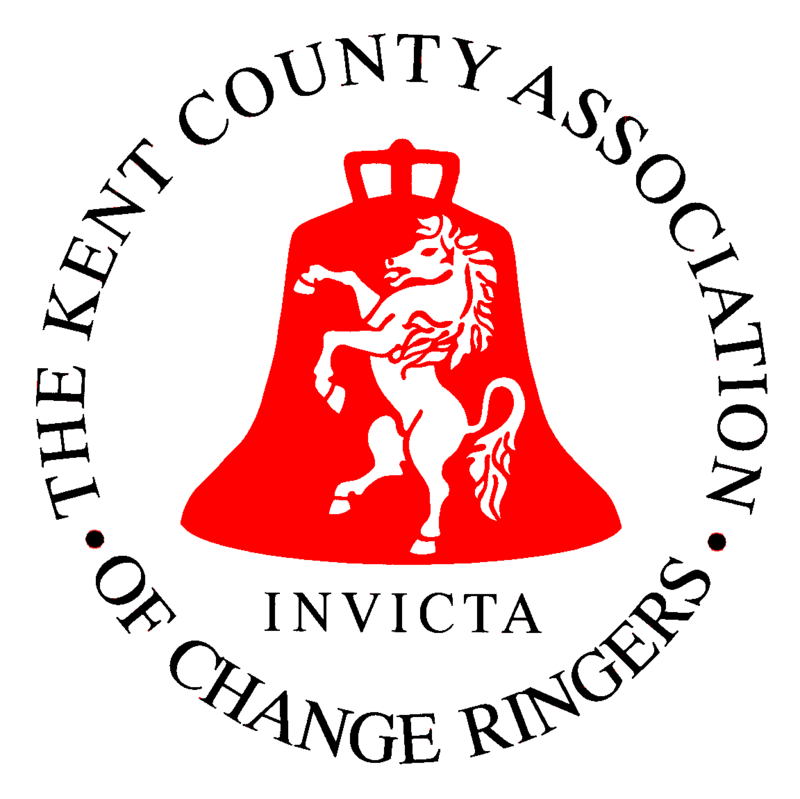 After logging onto the main KCACR website I read the details about the memorial bells in Canterbury Cathedral, and the memorial book that has also been presented to the Cathedral. 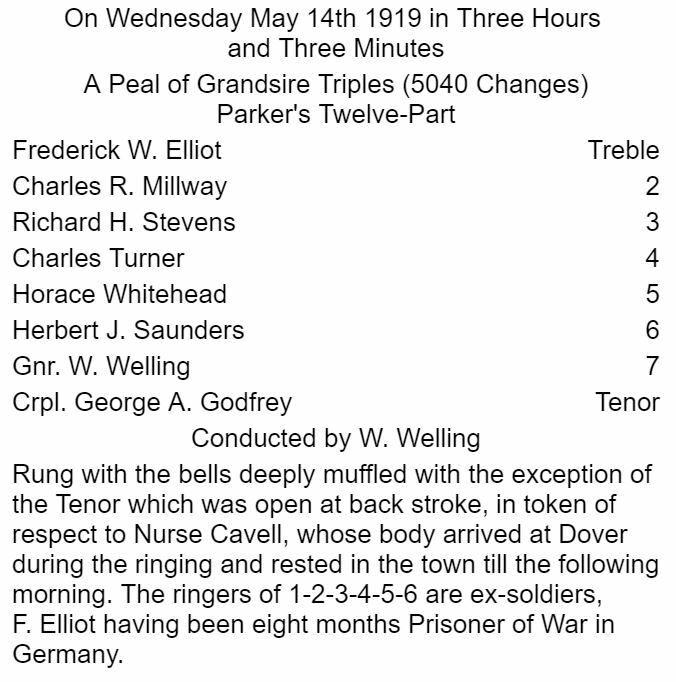 My mother knew that her father had been in the choir at East Farleigh, but not that he was a bell ringer. She still has his confirmation card from East Farleigh church. Tom Cox never saw his daughter as he was on active service when she was born. My mum who was born in Maidstone has visited the church in the past few years. My wife and I, and our two children have visited the Pozieres memorial where we took some photographs of the plaque with my grandfather’s name. We have also been several times to the small cemetery at Vadencourt. I have found some information regarding the location of the regiment prior to the battle of 21 March 1918 and it appears it was based in the Vadencourt area. As there is a unknown soldier of the Royal West Kent buried there we look on it as a possible resting place for Tom Cox. My mother only has one small faded photograph of her father. I wonder if you found a photograph of him when you compiled the book? She thinks that he was actually born in the village. I wonder also if we would be allowed to see the memorial book if we visited Canterbury Cathedral? I have lots more questions but I will leave them for another time, also if you need any information, I will help you if I can. This sort of news makes the jobs of webmaster and archivist all seem worthwhile. Do please keep on sending in your reminiscences. But not hardened enough it’s true. You’ll be marching into Hell. Dying next day where he lay. On the battle’s very last day. To win a few miles, so they say. The other two were never found. And also on foreign ground. — The Somme. 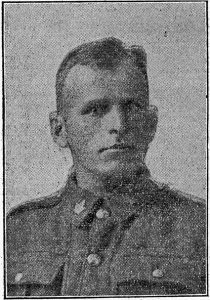 Fred’s obituary subsequently appeared in the East Kent Gazette on 2 November 1918, and he was described as “a young man of very genial temperament and much liked. He had exceptional strength, and was of fine physique.” He lies buried in the British Extension of Queant Communal Cemetery, and is also commemorated on his mother’s grave in the village churchyard at Hartlip. Yesterday I went to a day course at the British Library. We had the opportunity to go to their stores, which was quite exciting. On the way, in one of the non-public areas, we passed a First World War war memorial and I noticed that it commemorated British Librarians and that places were listed alongside the names. 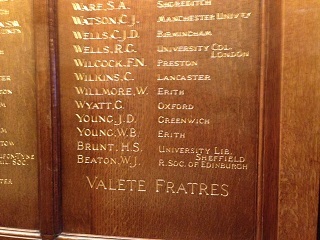 I immediately thought of the Erith ringer, William Barton Young, and sure enough his name was included. Attached (above) are a couple of photographs which I hurridly took on my phone for the record. When we were in France last summer, Hedley and I visited his grave for the first time and, as usual, played the tape of the Canterbury bells and left a Remembrance Cross.